Shipping: Media Mail (USPS) 3 to 5 days - Orders after 12noon during business week will ship next day. 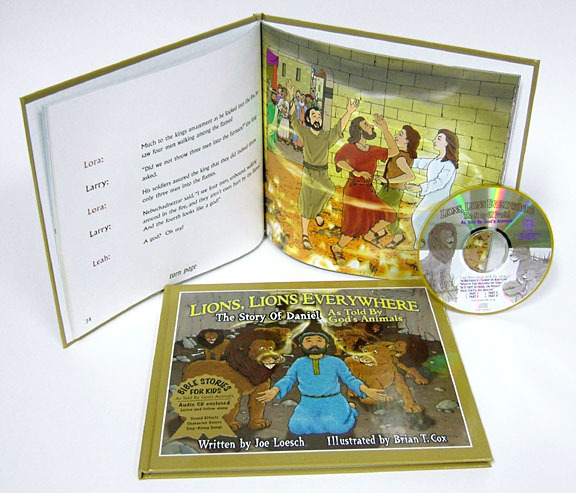 ​The story of Joshua - Follow along with Donkey Dan, Beulah the bear and her curious cub, Becky, and learn about the great Israelite leader, Joshua. See how the Israelites crossed the mighty Jordan River, and learn about the "Ark Of The Covenant" and how Joshua and his men marched around Jericho and watched the evil city crumble to the ground before the Lord! Sing along with our animal friends, and most of all, see what wonders you can do when you follow God. This book has 4 original sing-along songs.